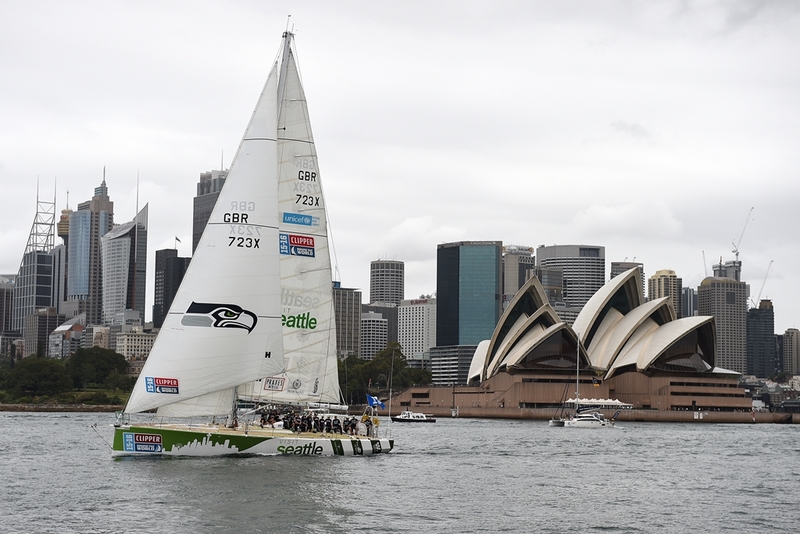 A Seattle Seahawks sail was hoisted recently in Sydney Harbor, Australia, by the crew of the 70-foot Visit Seattle Clipper Race yacht. Namesake of Seattle’s destination marketing organization, Visit Seattle is promoting the Emerald City while racing some 20,000 nautical miles to date across the world’s most dangerous oceans. 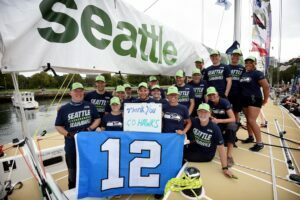 Arrival at the fourth port of call in the Clipper Round the World Yacht Race coincided with Seahawks Fan Appreciation Week. The crew of mostly amateur sailors, led by Skipper Huw Fernie, donned Hawks caps and shirts featuring “I’m in,” “12” and “Go Hawks” to cheer the home team in front of the Sydney Harbor Bridge and the Sydney Opera House. Here’s a short interview in the harbor with our skipper. 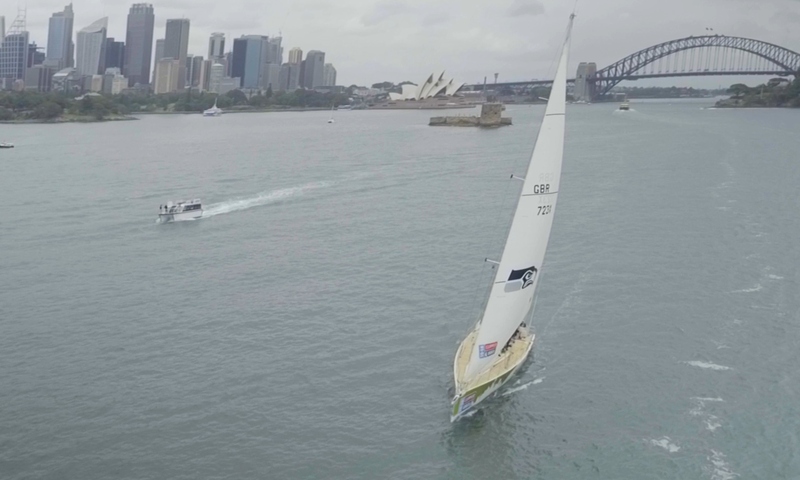 The yacht race, which benefits Unicef, is the world’s longest ocean adventure, spanning 40,000 nautical miles and calling on 14 ports and nine countries. It’s regarded as one of the toughest endurance challenges on the planet. This week, now beyond the calm waters of the harbor, the racing yachts are in full sail in the Henri Lloyd Hobart to Whitsundays Race, which forms Race 6 of the global Clipper Race series. Next port of call: Vietnam. Then on to Qingdao, China and the Mighty Pacific Leg 6 which crosses the Pacific to Seattle this April where homeport fans will give the Visit Seattle crew a champions’ welcome. You can follow the race via a real-time race tracker on the Visit Seattle home page. And you can follow the social conversation via @ClipperRace and the Visit Seattle yacht at @VisitSeattleRTW. Join the conversation at #ClipperRace or #VisitSeattleRTW. 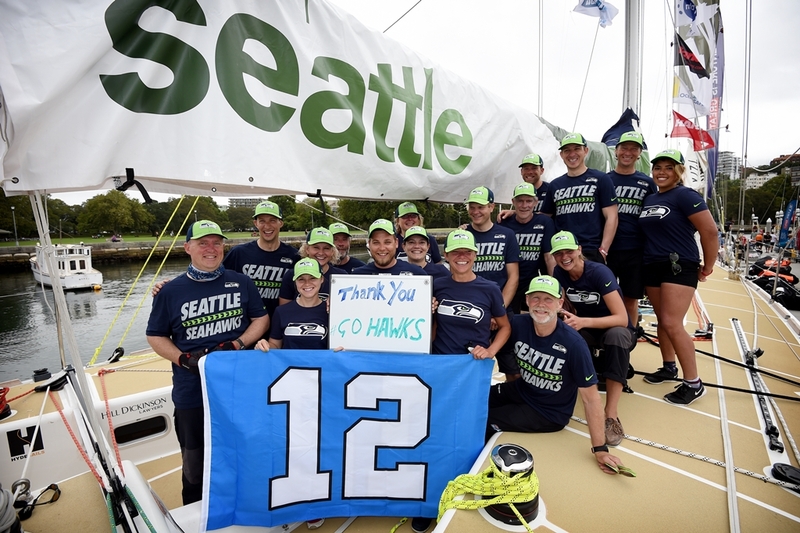 Go Hawks…and go Visit Seattle yacht and crew!